Kevin Colbert and Mike Tomlin believe in cutting their loses quickly as the Steelers cut cornerback Justin Gilbert just months after trading a 2018 6th round pick to acquire Gilbert’s services from the Cleveland Browns. Going into the 2014 NFL Draft, cornerback was the Steelers most urgent area of need, and by all accounts Justin Gilbert was the player Pittsburgh’s brain trust was targeting. But the Cleveland Browns got him first, picking him 7th and making him the first defensive back drafted that year. 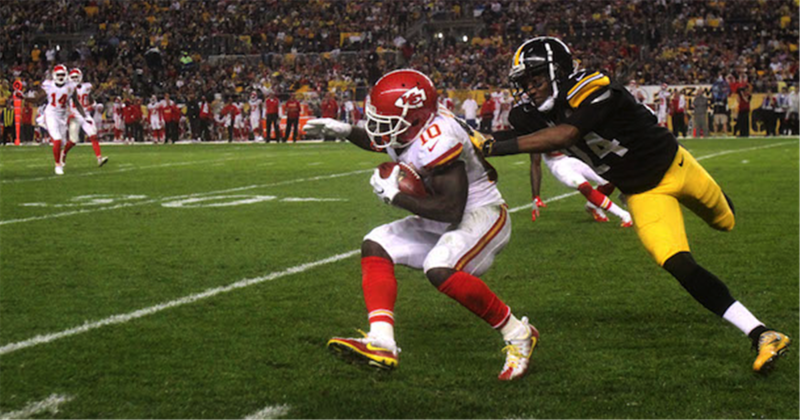 The Steelers Justin Gilbert tries in vain to tackle Tyreek Hill of the Chiefs. Photo Credit: Pittsburgh 247 Sports. 3 months later Justin Gilbert got infamously burned in a couple of Ben Roethlisberger to Markus Wheaton hook ups the Steelers 2014 season opener against the Cleveland Browns. Ironically, that’s probably the most anyone in Pittsburgh has seen of Justin Gilbert since then. By Pro Football Reference’s count, Justin Gilbert participated in a just 1.05% of the Steelers defensive snaps this season, suiting up in the secondary during the Steelers regular season win over the Kansas City Chiefs and their regular season loss against the New England Patriots. Theoretically, Gilbert should have given the Steelers kick return game some juice, but Gilbert only 3 kicks during the regular season with those attempts coming against the Chiefs and Patriots. As the playoffs arrived, Justin Gilbert’s role seemed to be expanding, as he returned kicks for the Steelers in their playoff win over the Chiefs and their AFC Championship loss to the Patriots. Gilbert did run for long returns of 32 yards in the regular season and 26 yards during the post season, but clearly Steelers Special Teams coach Danny Smith didn’t see enough of a spark to lobby Mike Tomlin and Kevin Colbert into keeping him on the roster. On the face of it, Justin Gilbert’s release is a surprise, but perhaps it shouldn’t be. Keith Butler’s defense struggled early during the 2016 season, but you can trace the unit’s turn around to increased playing time by Sean Davis, Artie Burns, Javon Hargrave and James Harrison. Justin Gilbert remained a spectator through it all. When the Steelers needed to add a 6th defensive back, Robert Golden and/or Jordan Dangerfield got the call as opposed to Gilbert. Nonetheless, the Steelers decision to cut Justin Gilbert thins out an already sparse spot on their depth chart. Artie Burns and Ross Cockrell will return to training camp as their starting cornerbacks, with William Gay penciled in as their slot cornerback. While William Gay had a solid season in 2016, he will be 32 next season and cornerback in the NFL is a young man’s game. Senquez Golson will arrive in Latrobe with a shot at the Steelers slot corner position but, given injury history that 2015’s 2nd round pick has had, it would be a mistake to bank on contributions. The Steelers also have reserve cornerback Al-Hajj Shabazz who spent time on both their active rosters and practice squad in 2016. In a nutshell, cornerback was already a Steelers priority for the 2017 NFL Draft and its priority status just got a bump. This entry was posted in Steelers 2017 season and tagged 2014 NFL Draft, 2017 NFL Draft, Artie Burns, Ben Roethlisberger, Danny Smith, James Harrison, Javon Hargrave, Jordan Dangerfield, Justin Gilbert, Keith Butler, Kevin Colbert, Markus Wheaton, Mike Tomlin, Robert Golden, Ross Cockrell, Sean Davis, Senquez Golson, Steelers Roster, Steelers secondary, William Gay. Bookmark the permalink.